Maintaining a healthy balance diet is beneficial at any age. Eating a healthy diet helps our bodies function and provides us with the immunity and protection from many diseases and illnesses. A balanced diet is not only determined by what we eat but also by how much of each nutrient we eat; it’s a combination of both quality and quantity. Scientific research proves that a healthy balanced diet, along with exercise and a healthy lifestyle, is key to living a long healthy life while being protected from certain chronic illnesses such as heart disease, diabetes and osteoporosis. As we advance in age, our bodies change and so do our nutritional needs. After the age of 70, we become less active and our metabolic rate slows down and so we require fewer calories to maintain our weight, for this reason, the 70+ Food Pyramid is narrower than the traditional pyramid. However our bodies do require higher levels of specific nutrients like Vitamin D and calcium to help us maintain healthy strong bones, folic acid to reduce the risk of heart disease and strokes and to help keep our minds sharp. In order to get these vital nutrients, the food pyramid for older adults emphasizes leafy and darker colored vegetables such as spinach, broccoli, sweet potatoes, carrots and squash as well as bright colored fruits like strawberries, mangoes and oranges. 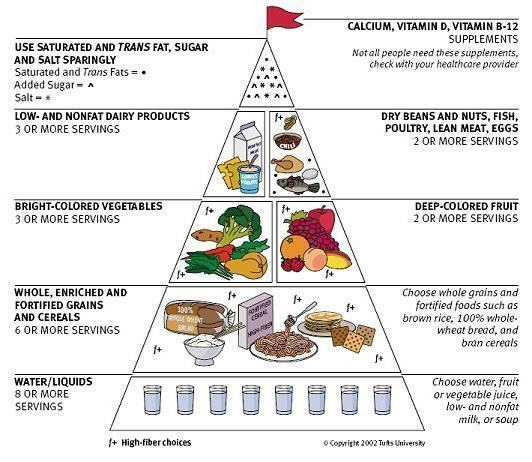 The pyramid also highlights the importance of consuming whole, fortified and enriched grains and cereals such whole wheat bread and brown rice. These foods are rich in fiber therefore reducing the problems of bowel functions that many older adults have. To Avoid obesity, older adults are encouraged to eat foods that are have lower percentages of fat such low fat or fat free dairy products and cut down on oily snacks such as sweets, cookies and cake. According to the 70+ Food Pyramid older adults need at least eight servings of water a day. They may also need certain supplements such as calcium, Vitamin D and Vitamin B12 which are suggested by the red flag at the top of the pyramid.